Summer will soon leave and as Fall enters to remind us that in order to grow and become new again, just like the trees, we can shed and let go to prepare for healing and rebirth. One of the wonderful things about Reiki is how much is nourishes our roots and stabilizes our internal being. It truly brings healing on all levels – mental, emotional, physical and spiritual. 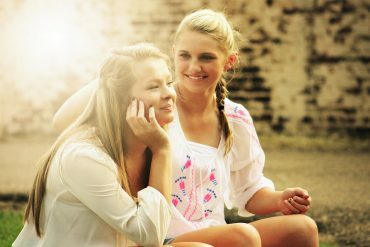 As the kids go back to school, our “early Friday’s” at work end, the schedules become more hectic, and we begin to prepare for the coming hibernation and potential isolation that Winter will bring, we can look to the healing benefits of Reiki to support us as the energies and pace of life shift. There are so many ways Reiki has benefited my life – less anxiety, no worries, freedom from pain, the ability to stay focused, knowing how and when to say no, having a confident sense of who I am and what I want to do in each moment and feeling peace and love in the relationships that are meaningful are only a few changes Reiki has brought to my life. The Reiki journey brings to each of us what we need. It is my sincerest wish and greatest joy to offer Reiki classes to those who feel called to add Reiki to their lives. This month, join me for Level 1 Reiki on Saturday, September 29. Those who take the class or have already received Reiki 1 training elsewhere may also attend Level 2 Reiki on Sunday, September 30. To read an overview of the levels, go here. Each class meets for a follow-up instruction day on Saturday, November 3. This class will review what you have learned, allow for questions that may come up after your initial training and will support practice time so you can be confident in your Reiki abilities. Level 2 participants will need to attend the second instruction session from noon until 2:00 and are encouraged to attend both follow-up classes. 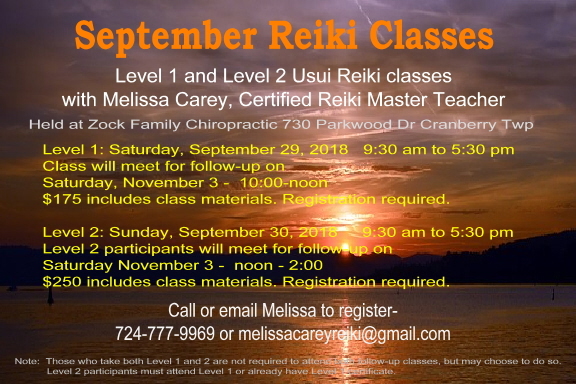 Please call or text 724-777-9969, email melissacareyreiki@gmail.com or use the contact form on this site to register for class.